Base class for a TCP/IP session. This class can be used directly by applications or can be derived to create specific sub-classes which handle application protocols. 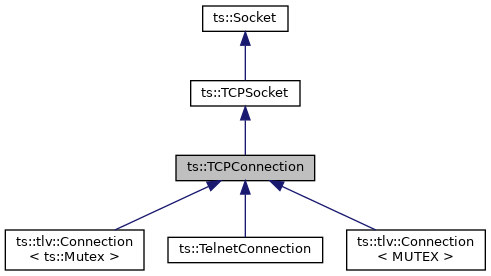 A TCP/IP client creates a TCPConnection instance and connects to a server. A TCP/IP server creates a TCPServer instance and waits for clients. For each client session, a TCPConnection instance is created. 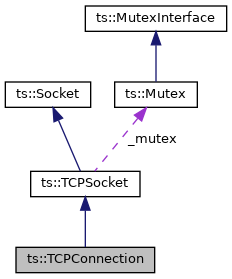 For a detailed scenario of the server side, see the class TCPServer. The following lists the typical client-side scenario in the correct order. Many steps such as setting socket options are optional. The symbol [*] means mandatory. Depending on the platform, some options settings are sensitive to the order. The following order has proven to work on most platforms. Invoking close() is optional since the destructor of the class will properly close the socket if not already done. Invoking disconnect() is also optional but is highly recommended. Closing a socket without prior disconnect is considered as a session abort by the remote peer. The peer may thus consider that something went wrong may take unexpected corrective or rollback actions.